A Blonde Ambition: How Do Ya Like Them Apples? That sounds wonderful. I was looking through several of my cookbooks last night & kept going back to the apple pies & the berry crisps. YUM! It is so not wrong to eat dessert for breakfast...you have a serving of fruit AND dairy from the ice cream. I can totally justify that! dessert for breakfast is a-okay. maybe i'm only saying that because i ate 4 pumpkin spice cookies for breakfast. but whatever, it's totally fine!! could you send some of that over here to kentucky please? it looks so delish! Yum, yum,YUM! Looks so good. Next time you make that, hope you have room for one more! YUM!!! Paul Deen has the key to ANYTHING sweet!! Good luck with your spin class this week girl, Im sure you will do great!! 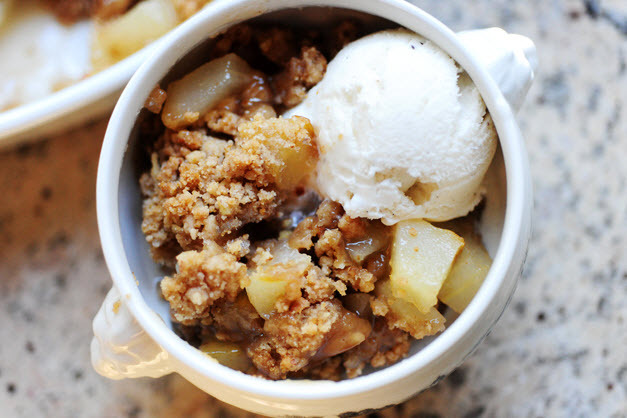 I absolutely love apple crumble...all the cinnamon and brown sugar!! LOVE LOVE LOVE and I'm not even a sweet-tooth/dessert person. Oh, I like those apples a lot. Amen to dessert for breakfast. You can rationalize any of it... You put cream cheese on your bagel, so cheesecake is okay. 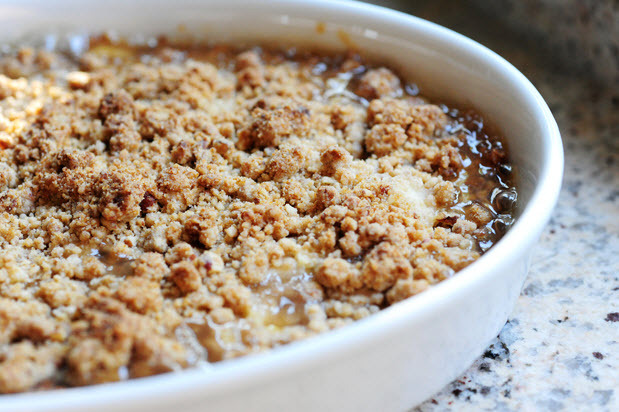 Peach crisp... that has fruit and oatmeal. There is no better way to start the day. Dyyying now! 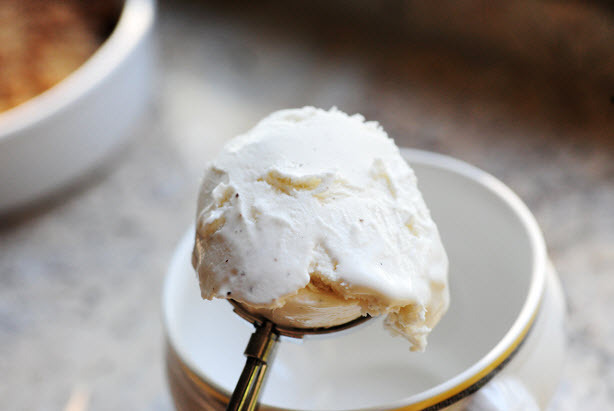 Dessert for breakfast is perfectly okay, especially when it is as yummy as this. All of those desserts have made me want something sweet! Ugh, I know what you mean about the weather! I just got back from Memphis and it was like 99 degrees there! Loving this post. And loving YOU as usual! You are too cute. And heck no, dessert for breakfast is always the right way for me. I weighed in on Sat morning, was down 6 more lbs, and decided to celebrate by having a piece of Turtle Cheesecake for breakfast...and what a fabulous day that was! Amen. Can't wait for fall either...I totally think you need to come visit little ole Oxford, MS soon ma'am! My grandma's homemade apple pie and ice cream is hands down my favorite dessert!! I like them apple a lot! Looks delicious and I love desert for breakfast! Today I started my day with icecream. Why not? you only live once! That looks so delicious!!! How is eating pie different from eating french toast or donuts? Neither are really good for you but they taste SOO GOOD!!! That being said, I would definitely be eating that pie in the morning if it were sitting in the pharmacy. My Uncle used to make a delicious Apple Dapple every holiday. It's not the same without him and his Apple Dapple! never a problem for me in regards to a dessert for breakie. done it before and will do it again. the apple is a good dessert. better than my chocolate ones i have had. Dessert for Breakfast. Now why wait for the end of the day when you can get a party started right? If you think about it french toast, waffles, and pancakes are all dessert in hiding. I want that dessert right about now.